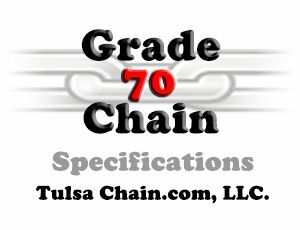 All of our Laclede Grade 70 Chain is Made in the USA. To help identify the grade and manufacturer all of our Grade 70 Chain is embossed with”L7”. The L is the chain manufacturer Laclede. The 7 identifies this as a Grade 70 Chain. 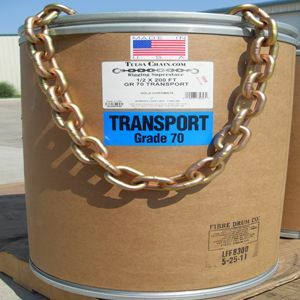 Grade 70 chain is typically finished with a Gold Chromate or Yellow Zinc. You will also find a trace code embossed on the chain. This trace code provides Information about the manufacturing history of the chain as well as the origin of the steel. The code is a combination of letters and/or numbers located on Grade 100, Grade 80, and Grade 70 chain. These grades are all heat treated. (A process that involves heating chain to extreme temperatures to harden the material and improve the metallurgical and tensile properties of the chain). 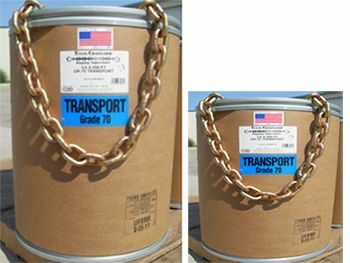 Grade 70 is a high quality, high strength heat treated chain that is becoming the standard for load securement. Grade 70 or Transport chain offers greater hardness and ultimate durability. Transport chain is primarily used and tow and binder chain in agriculture, construction, industrial, trucking and forestry. All of our Grade 70 Chain is 100 percent Proof Tested. Certs available free of charge.